Converti Bars motorcycle fully adjustable handlebars. Up or Down, Forward or Back. 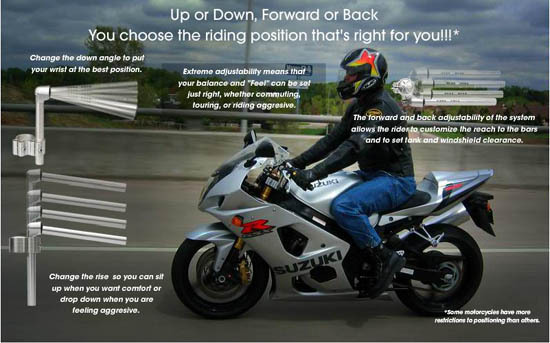 You choose the riding position that's right for you! Extreme Adjustability means that your balance and "Feel" can be set just right, whether commuting, touring, or riding aggresive. 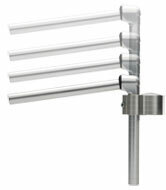 Converti Bars Change the down angle to put your wrist at the best position. Converti Bars Change the rise so you can sit up when you want comfort or drop down when you are feeling aggressive. Convertibars The forward and back adjustability of the system allows the rider to customize the reach to the bars and to set tank and windshield clearance. The V-Roc ( Vibration Reduction Offset Collet) handlebar design feels as solid as a one piece handlebar, yet dramatically reduces vibration. The down angle can be changed by repositioning the collet in 4 degree increments allowing up to 16 degrees of down angle convertability -8,-4,0,4,8 degrees. Convertibars patented Cyclops Clamps use high strength…. steel inserts in order to yield repeatable and extreme clamping forces that hold strong and reliable enough for daily changes and the most radical stunting or racing. What is it made of? High strength, light weight 6061/T6 billet aluminum is used to make Cyclops clamps, riser and handlebars. The Clamp and handlebar can be positioned independent of each other, allowing 6 dimensions of convertibility and radical changes in riding position allowing riders to fit their bikes to their chosen riding style or body position. Converti Bars motorcycle fully adjustable handlebars. Adjust the angle, rise and forward/back position of your handlebars by using Convertibars.